Oof. I’ve been struck down by the bug that’s going around, and I was utterly useless yesterday. As I floundered about, I realized that the pile of books by my bed is out of control. There are about 30 assorted books, of which I’m currently reading 10 at once. I don’t normally do that, but I feel like my focus has been scattered, so I keep finding myself picking up one book and reading a couple of pages, then reaching for another book for a couple pages. It’s a bit of a schizophrenic way to read, but then I remembered that this was exactly the way I powered through my textbooks when studying for college exams. I don’t know if I’m absorbing more material this way or not, but the variety is sort of refreshing. Beneath the 10 books in rotation, I found the book above. I hunted it down and ordered a used copy from Amazon a long time ago when I read Sarai‘s lovely review of it. The cover speaks of a well-loved and oft-thumbed through copy. Published in 1969, it’s full of charming illustrations and what appears to be a gentle style of writing, and although it hasn’t made it into my rotation yet, its turn is coming soon. I’ve mentioned this before, but I’m determined to become well-versed in fit. Yes, let’s call this Project Survival of the Fittest. I’m aiming to start this…evolution, I suppose, at the beginning of 2016 since there’s no way no how that I’ll finish the book before then at my current glacial speed. But first, I have to survive this pesky quasi-flu. Off to stock up on cough drops! After receiving even more new-to-K clothes from our neighbor last week, we went through K’s entire closet and all of her dresser drawers to take stock of her clothing situation. It is, in a word, crazytown. I know there’s a whole lot of capsule wardrobe talk going around the interwebs, and I so admire the concept, but as we sorted through hundreds of items that I’ve made for K, it was time to admit that we’ve crossed over into the opposite of capsule: hoarder territory. “We have to get rid of this, I made this three years ago!” I beseeched, holding up a wrinkled floral dress. K shook her head resolutely. And the thing is, most of the clothes I made when I first started sewing regularly for her still fit. I switched tactics and taught her the Marie Kondo method and asked her to only keep the garment if it sparked joy. She said “thank you and good-bye” to 15 things. On the one hand, this is ego-boosting on my part, but on the other hand, it doesn’t solve our problem. An excessively sentimental mother-daughter duo trying to eliminate handmade clothes is a recipe for disaster. 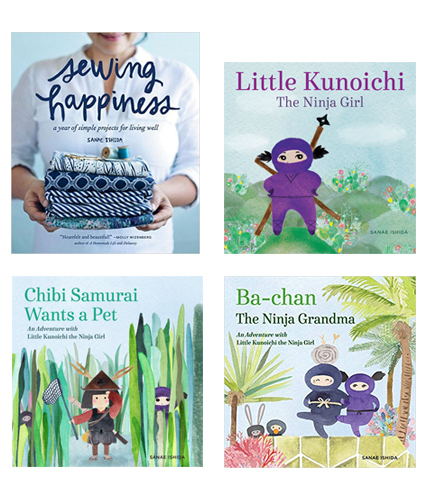 I keep revisiting my internal conflict of wanting to continue practicing my sewing vs. the guilt I grapple with as I generate more clothing than my daughter could possibly need. I love love love sewing for her. As we sat amid a literal mountain of clothes, we figured out that she could wear something different every day for a year. Every. Single. Day. This is ridiculous. 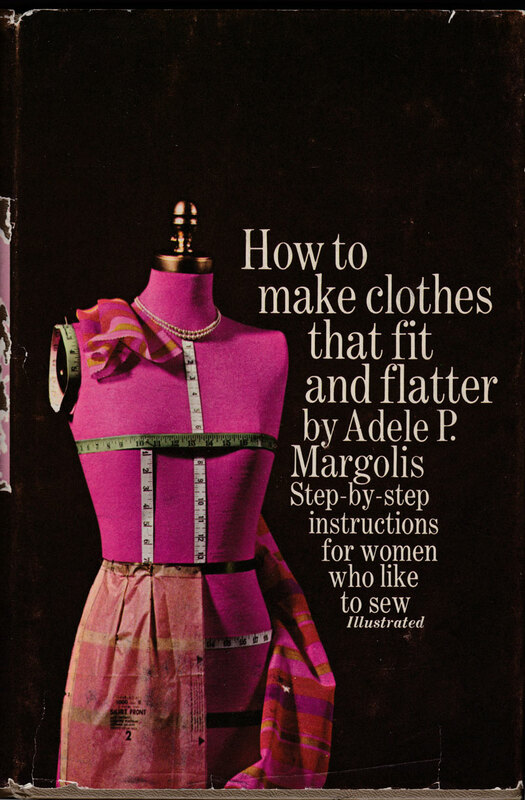 Yes, the obvious answer is to stop sewing for her. 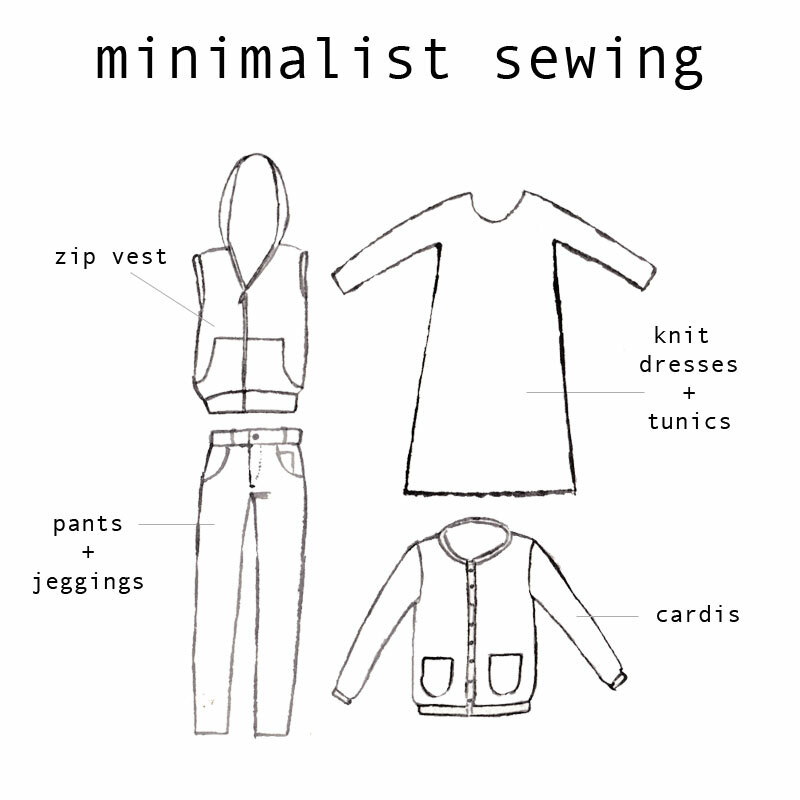 But I’m not quite ready for that so instead I’m going to adopt a minimal sewing plan for this autumn/winter. I’ll focus on clothes that she will actually wear regularly like knit tunics/dresses and skinny jeans and jeggings (or plain leggings). And for some reason, she loves zip-up vests and cardigans. I’m going to have to deploy some sneaky methods to reduce her gargantuan wardrobe. I know I’ll fall off the wagon and whip up some impractical, sure-to-be-ignored linen outfit here and there, but right now, I feel like I can get all minimalist and capsule-y with my sewing. I’ve got this. P.S. A knit tunic coming up on Wednesday – I tried something new! I covered in detail all the within-arm’s-reach items on and in my sewing table a couple of days ago, and today, we move onto the cutting table and ironing station. I purchased the cutting table from Jo-Ann’s about four years ago, and I have to admit that I’m not happy with it. The screws keep falling out, and the surface is badly scuffed and portions of the MDF coating are peeling (I have a piece of packing tape on those portions, which I’ve cleverly hidden under the cutting mat). But it’s been doing its duty, so I can’t complain too much. One day I hope to make a customized cutting table that’s narrower and longer. 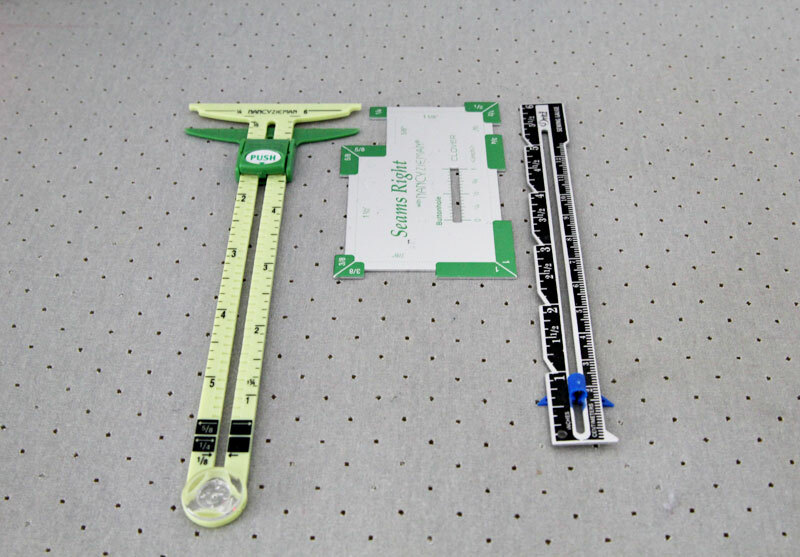 The Gypsy Gripper on a 24-inch quilting ruler. 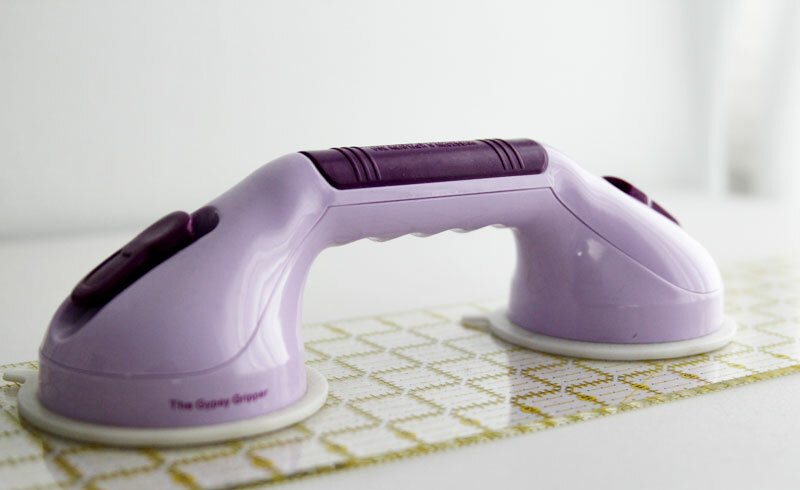 This has made cutting bias tape (which I do a lot) and knit fabric in general about a thousand times easier with a rotary cutter; it’s also useful for drafting patterns and sometimes, I use it as extra weight. 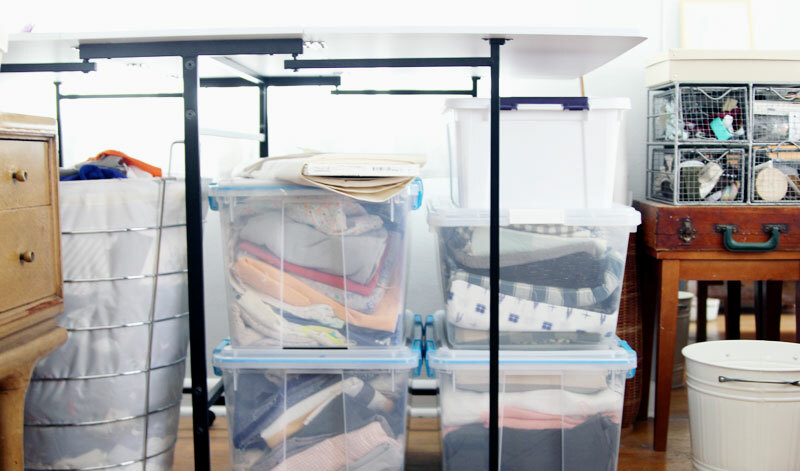 Underneath the cutting table, I store bins of fabric that I plan to use right away. A lot of the fabric in these bins will probably end up in the book I’m currently working on. That oversized laundry basket on the left is my scrap basket. As you can see, it’s filled to the brim. I also have a bolt of cotton muslin I use for pattern drafting resting on one of the bins. 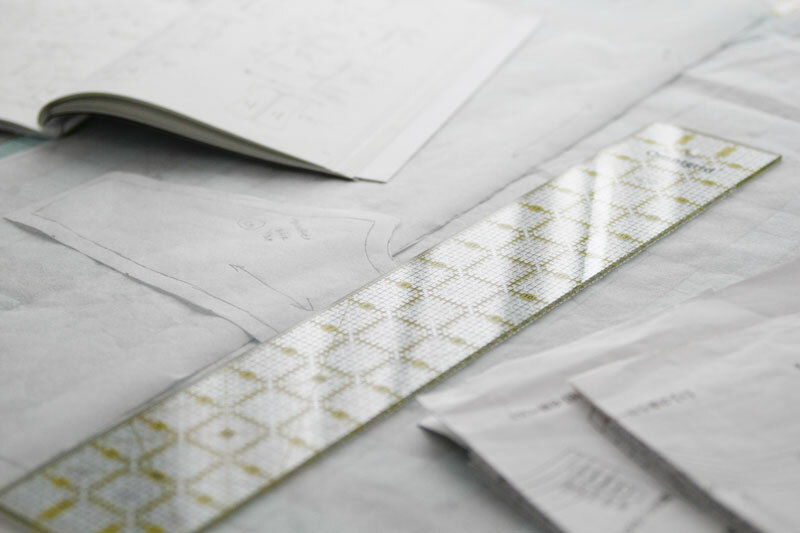 To the right of the cutting table, I keep my beloved Swedish tracing paper and some rolled up patterns from prior projects. That cool vintage wire organizer holds a bunch of props we used when we shot the cover of the book, and I haven’t gone through and organized them yet. The white IKEA bucket is my trash can that normally sits right beside the sewing table, but I moved it there to take photos for some reason. That wooden suitcase is a treasure of mine. My mom used to store her acrylic paints in there, and it fits perfectly on top of a cheap little table I used to use as a nightstand before it became a supplies-holder. And then we have the ironing station. Please excuse the corner that I failed to tighten properly. I use the ubiquitous Black & Decker D2030 , and I love it. I’ve tried a few models, and this one has treated me very, very well. And the fact that it’s not outrageously expensive adds to its allure. The ironing board is an extra-wide one — I got it from Amazon, I think, though it might have been Bed, Bath and Beyond and I never use the little metal stand for the iron but balance supplies there instead. I always keep the mesh pressing cloth (so awesome) at the ready. 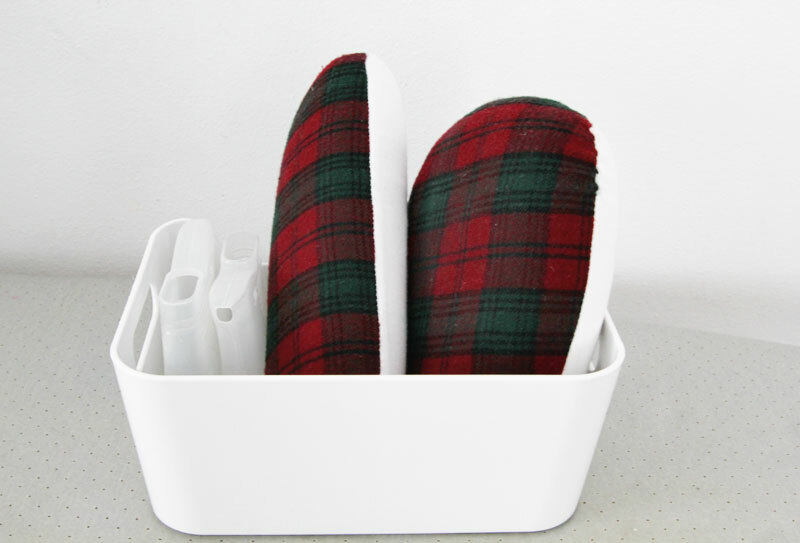 The ironing board cover is a recent discovery and it’s pretty great: the Brabantia Ironing Board Cover . The discolorations on the cover used to drive me crazy, and on this one, it’s barely noticeable. I’ve been using it for a couple of months, and I can only marginally detect the offending discoloration. And then tailor’s hams are essential for apparel pressing. They’re not my favorite things in the world, but they work. The little containers with the spout are for refilling my iron. And then my bias tape makers in every imaginable size. These are so, so great. The Clover brand is the only kind to get, as far as I’m concerned. 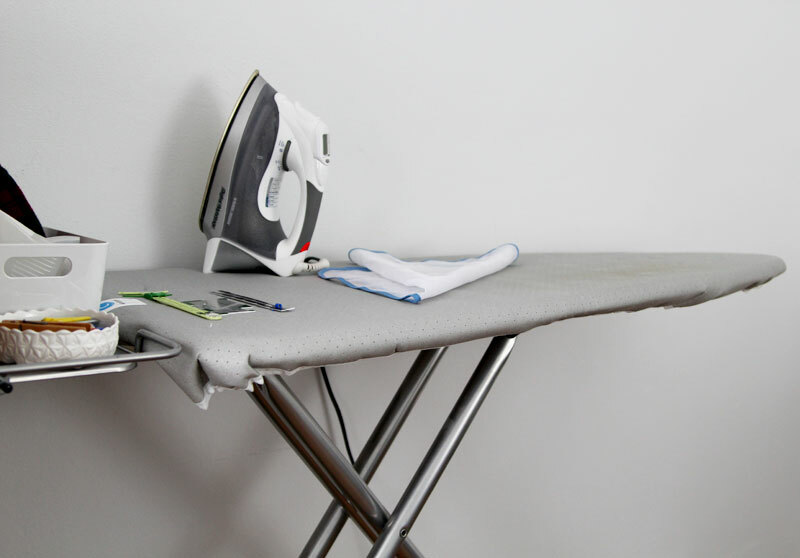 I also keep the iron cleaner (I can’t remember where I got it from), which I don’t use very often, but it’s fabulous. What do you think? I’m always looking to make it more effective, so all suggestions are welcome! 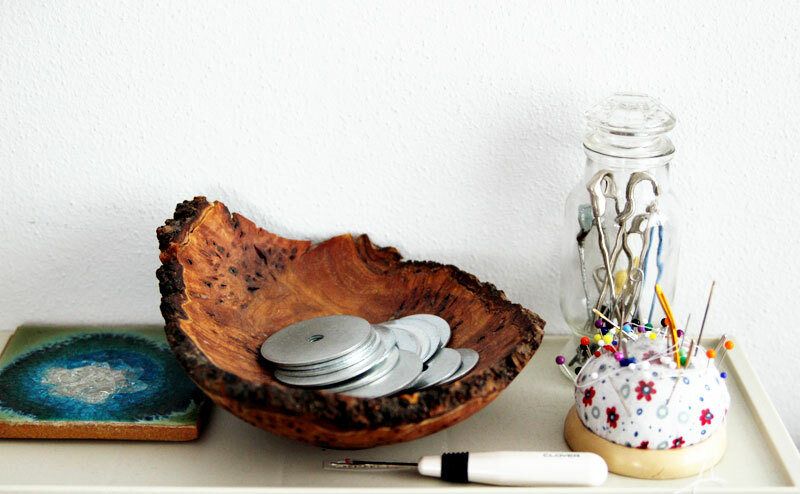 I’ll keep dreaming of my Pinterest-worthy studio, but in the meantime, I’m making do just fine. P.S. I need to let you know that I included Amazon affiliate links – it’s something I’m testing out because the husband keeps begging me to make more money and to at least give this affiliate thing a shot. I promise to only do this for things I absolutely adore. I can’t imagine earning more than a few pennies off of this, but it’s important to keep marital relations happy, people. This is my first time ever doing it, so it’s very likely I’ve messed something up…oh well, it’s always good to try new things, right? Good morning! I did sew something for K: an absolutely dull blue and not particularly attractive Seahawks tee-shirt at my daughter’s request, because she — much to my shock — is a football fan. Who knew parents completely oblivious to the Superbowl would produce a gung-ho 12th man? 12th man is the term used for a Seahawks fan, as I understand it, but don’t hold me to it. But why subject you, my discerning friends, to a stenciled tee yet again? Instead, I thought it might be a little more interesting to continue showing you my sewing space. I love seeing how other people have their work areas set up and maybe you would have suggestions for improving mine – that would be much appreciated! I ended up with more photos than I expected, so there’s going to be a part 3 on Wednesday. Shall we continue with the desk? 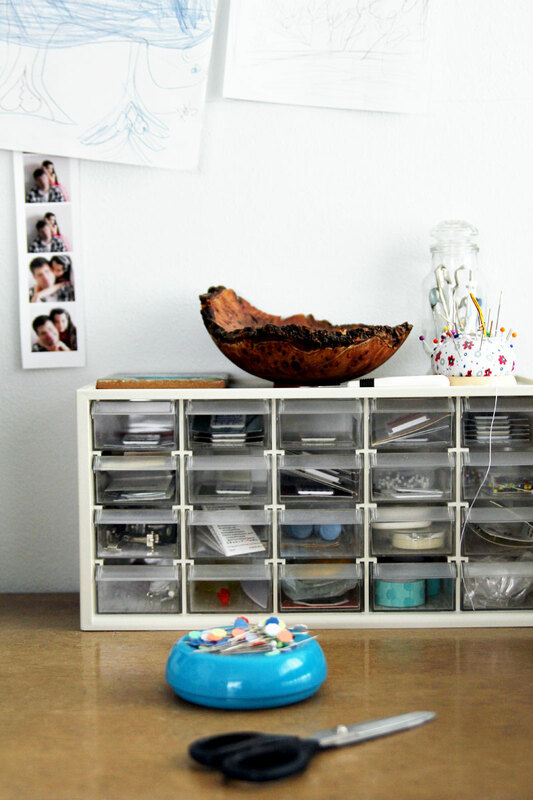 I picked up the little organizer with drawers from Storables years ago and it works really well to keep all of my odds and ends stored yet accessible (I can’t find the 20-drawer version online, but it’s similar to this). On top of the little organizer, I keep my weights I get from the hardware store for tracing patterns. They’re in a wooden bowl a dear Kiwi friend gave me as a gift. I’ve had that bowl for over fifteen years and it makes me happy to have this memorabilia from her (she lives in Australia now and it’s been many years since we’ve had a proper face-to-face chat). The glass jar holds vintage safety pins from my mom, and the pincushion for hand-sewing needles and extra pins is from Daiso, our local Japanese dollar store. 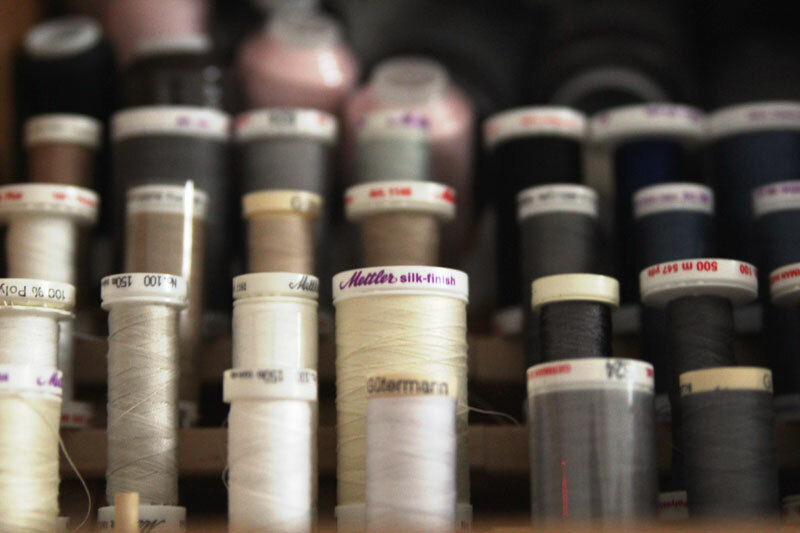 The jumbo darning needle (the gold one) is handy for poking out corners or threading elastic. The pretty glass coaster is from Anthropologie and I love the colors and sparkle. And of course, I can’t live without my seam ripper nearby. The tiny little drawers are ideal for my assorted tools. The first row is exclusively for the machine needles I use the most (except the twin needles – those I dislike and avoid using). You can see that I separate my needles by type. The second row has extra hand-sewing needles, less frequently used machine needles, and extra pins. 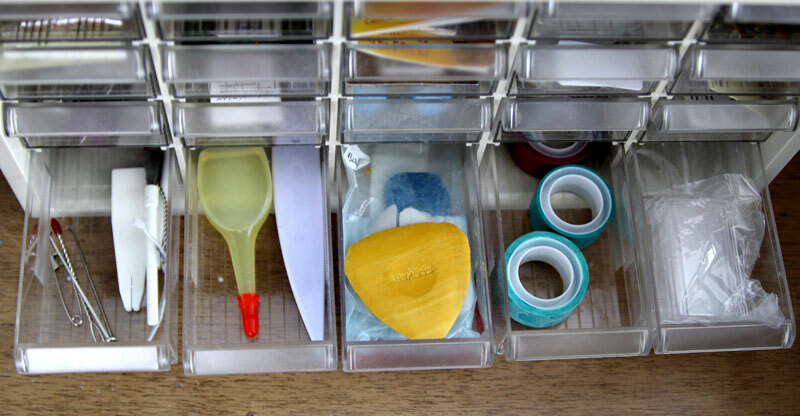 The fourth row has threaders, bodkins, the little brush for cleaning out the sewing machine dust, oil, point turner and seam presser (never used it), chalk, and tape for assembling PDF patterns. 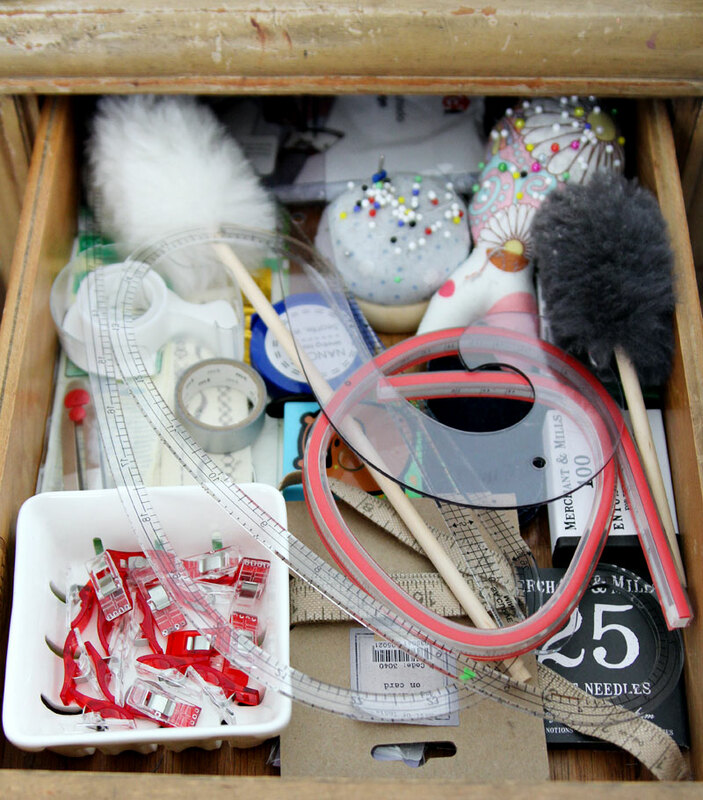 That last drawer contains plastic labels for the drawers, which I obviously haven’t bothered to use. 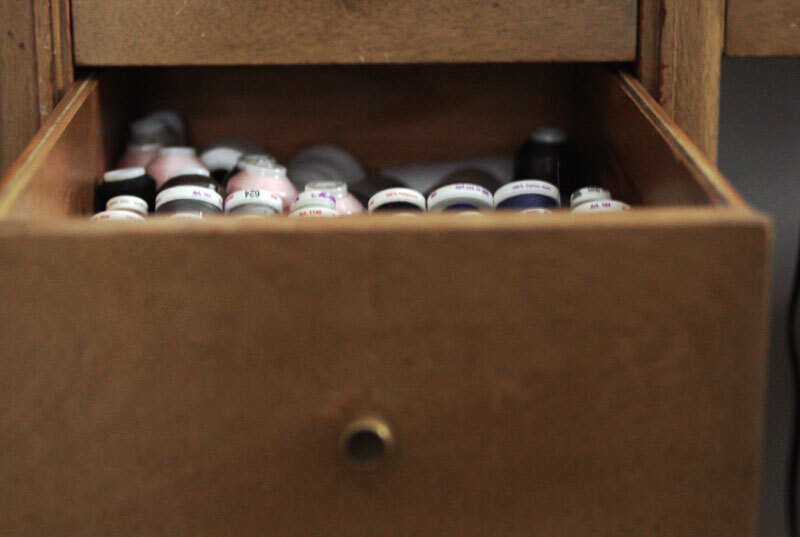 Moving along to the desk drawers, I already showed you the one that contains the my fave thread colors. The drawer above it houses the bobbins and my walking foot and a Bernina pouch that came with the sewing machine. The pouch contains some mysterious tools that came with the sewing machine — I have yet to figure them out. 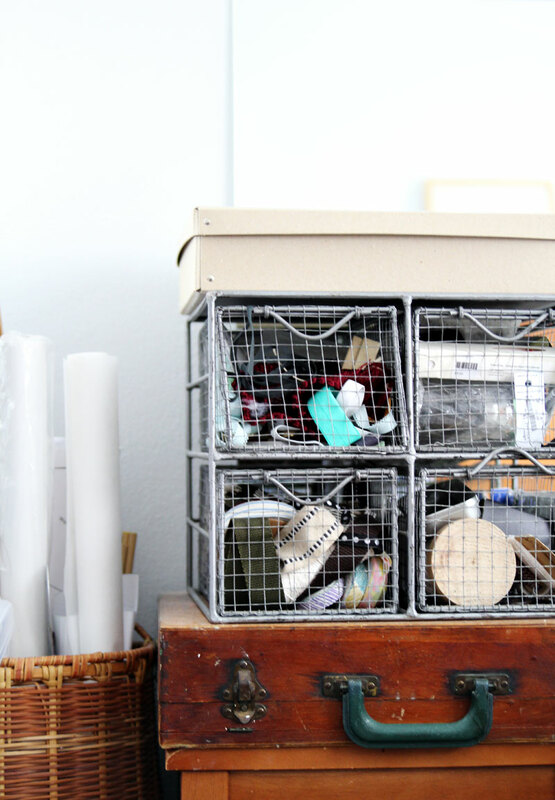 This is also where I keep the instruction manual for my sewing machine. I use the tweezers to thread my serger and like to have it accessible. 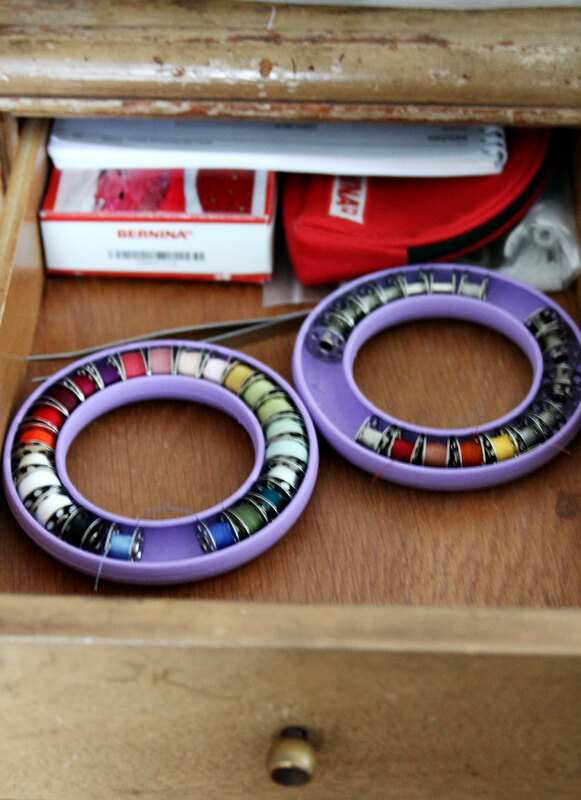 The center shallow drawer is still in progress and has all of my other thread spools. And then on the right, the top drawer is a bevy of tools I couldn’t fit into the desktop organizer and don’t want to have out in the open necessarily. 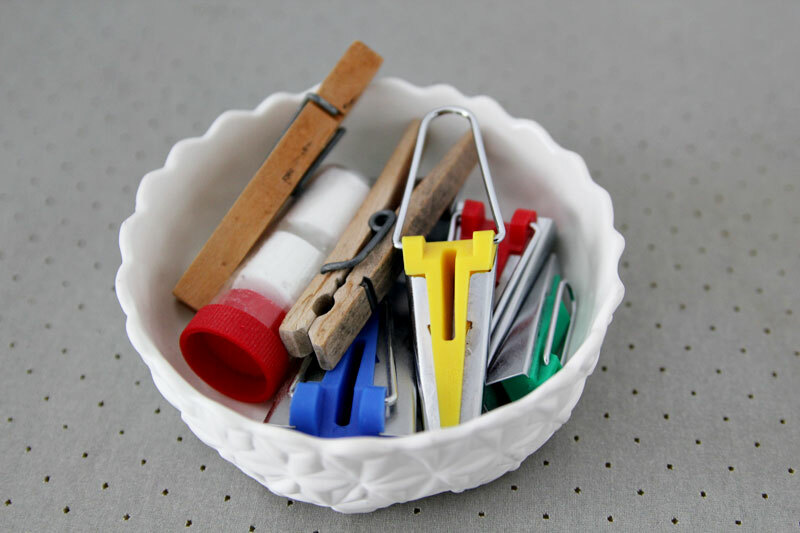 More pin cushions, needles, tape measures, tape, dusters, wonder clips. It used to look a little neater when I first cleaned it out. 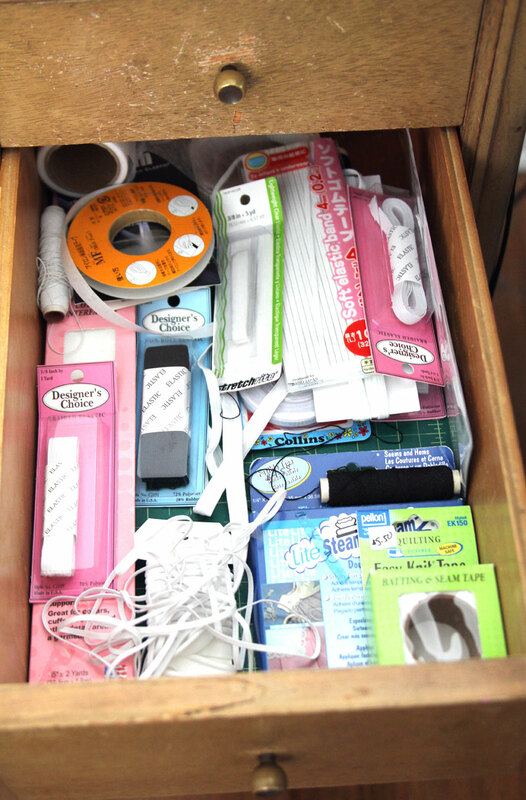 The final drawer is where all of my favorite elastics congregate. I often use the 1/8″, 3/8″, 1/2″ and occasionally the 5/8″ and 1″. I also toss in double-sided fusible tapes, knit tapes, Steam-A-Seam and piping in here. 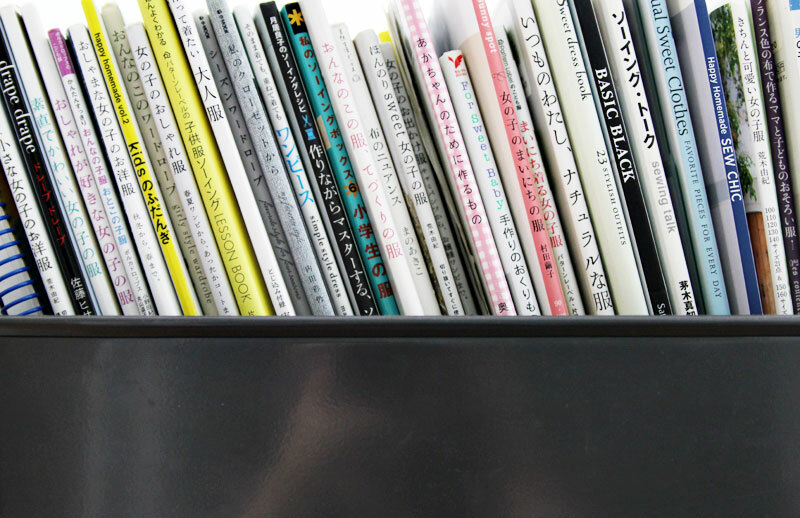 On the left side of my sewing table, I keep all of my Japanese sewing books and a selection of other, non-Japanese sewing books, along with my reference binder for commercial patterns. To take this photo, I had to pull it out into the hallway since I didn’t have enough room to frame its entirety. 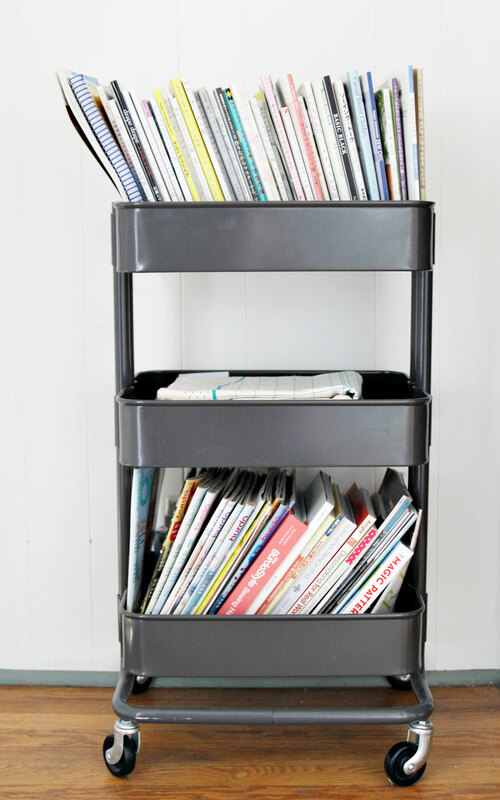 Now that I’m looking at these images, I’m itching to organize everything better. This was a good exercise! Stay tuned for part three: the cutting table + ironing station! 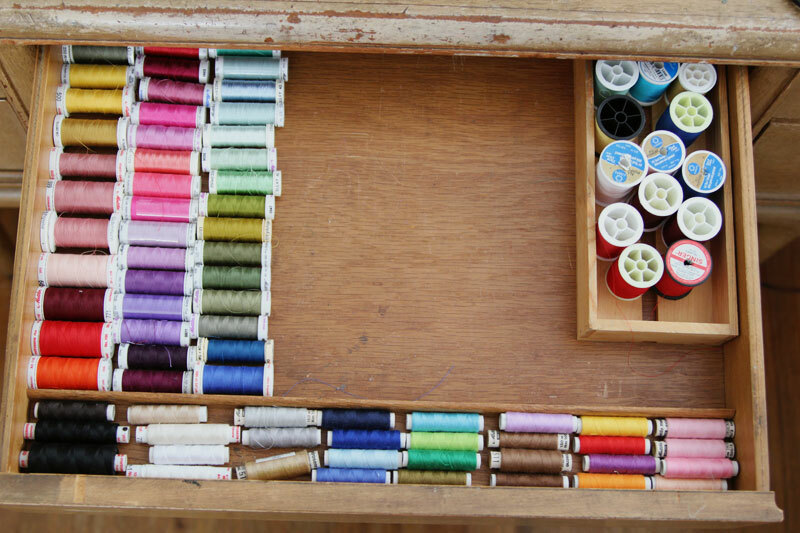 I organized my sewing table. 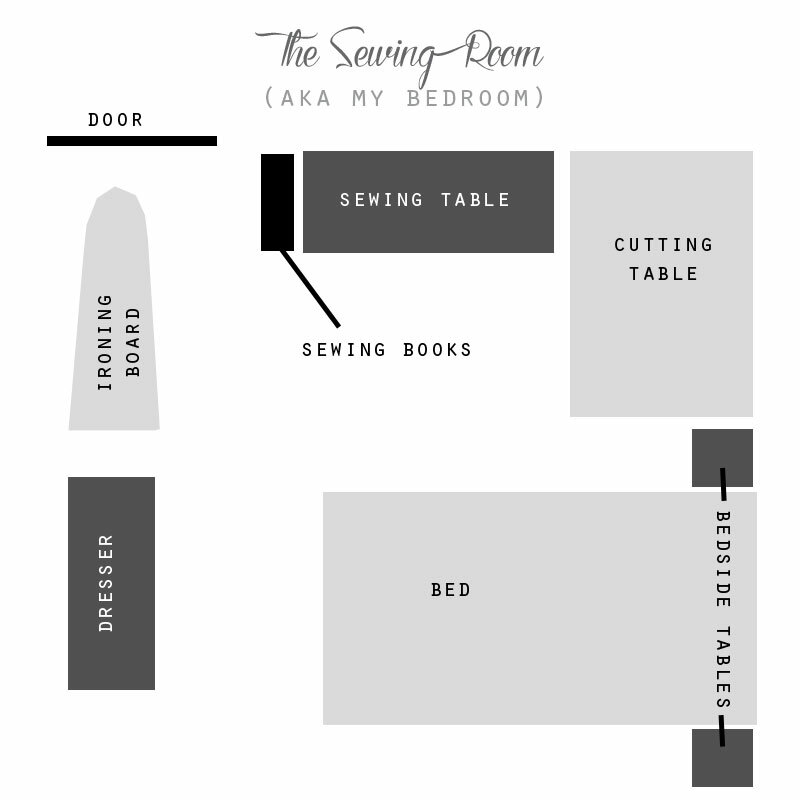 Have I told you that I sew in my bedroom? 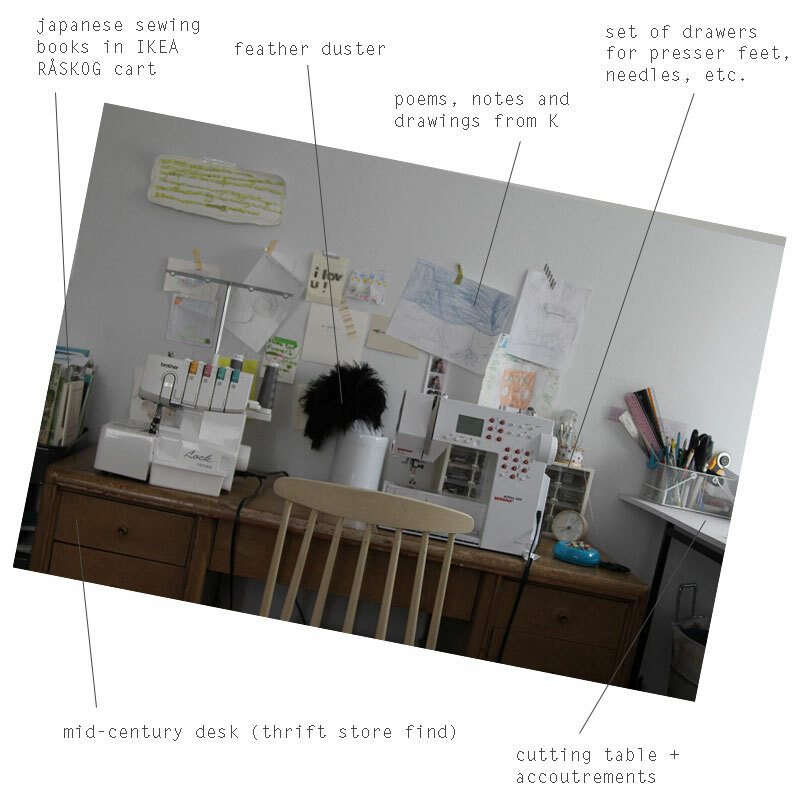 I know it’s sacrilege to have a workspace where you sleep, yada yada yada, but I moved my so-called “atelier” when K was in kindergarten three years ago because she would get scared at night and pad two floors down all the way to the basement where I would be toiling at my Bernina into the wee hours. Our bedrooms are next to each other, and I figured that if she could hear the hum of the machines, she would know that I’m close by and feel assured. So far it’s been working. Plus, if a sewing table in the corner of a bedroom is good enough for Flossie Teacakes, it’s good enough for me. Mark Bittman cooks in a pint-sized kitchen (I half-heartedly tried to see if he’s upgraded since 2008 but I didn’t find anything), and though he doesn’t love it just as I don’t totally love my ad hoc craft station, it gets the job done and sometimes, magic happens. 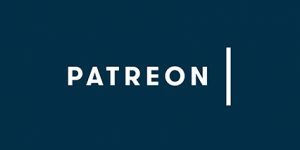 Of course, I drool over capacious and stylish studios on Pinterest, and though I sigh at the dreaminess of it all, I’m quite content with the functionality of the current set-up. I have humongous thoughts on the benefits of limitations, but that’ll have to wait for another day. This is sort of a part one since the winter light in the Pacific Northwest makes photography a race against time and it was getting too dark for decent shots. 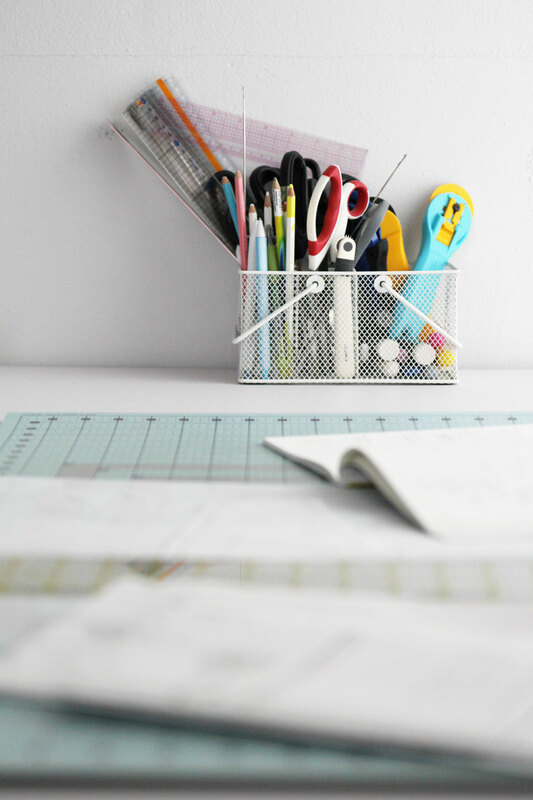 I’ll show you more close-ups of how I arrange all my stuff because I get geeky about organization and love to see how other people keep their materials corralled. More soon! © Copyright 2015. Sanae Ishida. All Rights Reserved. Design by Bloom.